When the Snow Melts is the autobiography of the legendary James Bond producer Cubby Broccoli and was published in 1998 a couple of years after his death. It was written with the help of his friend Donal Zec. Broccoli was born in New York in 1909, his family apparently responsible for bringing the first broccoli seeds into the United States. I like to think the James Bond films were an apology of sorts for making all those American children eat broccoli! In When the Snow Melts, completed just before his death, Broccoli looks back on his long life, friendships with the likes of Howard Hughes and Cary Grant, his beloved family, his struggles to get into the film industry, and, of course, his decades producing James Bond films and thoughts on Connery, Lazenby, Moore and what it took to keep cinema's most enduring franchise flourishing in ever changing times. Broccoli was known as a larger than life producer who always put the budget up on the screen and could get things done. He had to be both a diplomat and a showman to get the Bond films made in all manner of locations around the world and always seemed to have a solution to problems. When the huge 007 sound stage at Pinewood burned to the ground in the seventies, Broccoli mulled this disaster over for a moment and then ordered it to be rebuilt! He had various jobs in his younger days like a spell making coffins and selling Christmas trees and endured many difficult times - including the death of his wife Nedra which left him a widower with young children. It was the film industry though that Broccoli always dreamed of being involved in and through a lot of hard work he managed to get a foothold in the business, eventually setting up a production company in Britain after some dabblings in Hollywood. The opening chapters of biographies are sometimes are a struggle for me as my eyes tend to glaze over when I'm given family trees and memories of days at school etc but the book soon picks up when it moves onto the film industry and Broccoli begins to pick up bits and pieces of work as he slowly climbs the ladder. Broccoli talks about working with Howard Hawks and getting a position at 20th Century-Fox and this is all good stuff. He served in the US Navy during World War 2 and then struck up a friendship with director Irving Allen which led him on a path to Britain (where tax breaks made it a favourable place to make films at the time) and eventually a certain secret agent. Broccoli developed a fondness for Britain and through the Bond series created a lot of important work for the domestic film industry. There are about 30 pages of rare photographs in the book including ones of Connery just after he'd been cast. Broccoli notes that it was a battle to persuade their backers that the unknown actor was the man for the job but he stuck to his guns and Connery became the original (and for most the greatest) James Bond. Broccoli has a few barbs at Sean Connery in the book as Connery always used to slag him off, feeling he was never paid enough money when he was Bond. Connery didn't even turn up to Broccoli's memorial service when he died, unlike Moore, Brosnan and Dalton, who all paid warm tributes. Broccoli feels one-time Bond George Lazenby could have been an excellent 007 but it all went to his head. Lazenby left after one film on the advice of an agent (who told him Bond was dead) and Broccoli shrugs him off as a cocky young Australian who had no idea what he was doing and made a big mistake. Disappointingly but perhaps understandably Broccoli tends to gloss over the end of Timothy Dalton's tenure and not reveal too much about this. Licence To Kill had been a relative flop in the United States and after the litigation that had kept Bond off the screen for several years cleared Dalton stood down and was replaced by Pierce Brosnan. 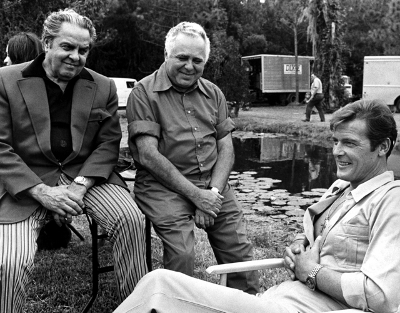 There has always been speculation that MGM insisted that Dalton be replaced before the film that would become GoldenEye went into production but I suppose that even if this story were true Broccoli would not have told us given the fact that he was good friends with Timothy Dalton. Broccoli liked Dalton and apparently first tried to cast him as Bond in the late sixties after watching a 24 year-old Dalton in The Lion in Winter. This is an enjoyable if undemanding autobiography that anyone interested in James Bond will be happy to read. 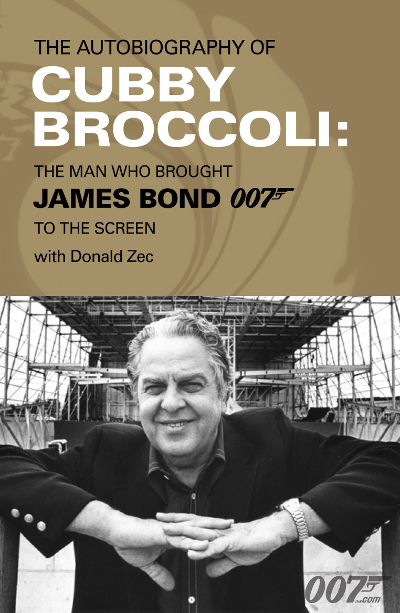 The book is full of famous names and interesting stories and a bittersweet reminder that the real James Bond series probably died with Cubby Broccoli. The Living Daylights was the last film that Broccoli produced in a hands on fashion when he was alive. Cubby comes across as a pleasant chap who lived an extraordinary life throughout the book and it's always interesting to be in his company for over 300 pages as he looks back on his long career. When The Snow Melts is nothing amazing but a book that Bond fans should enjoy.